For nearly two decades, Chris Bishop has done it all in his industry: From master electrician to industrial electrician, electrical inspections to full-service electrical contracting, to his latest passion – home automation and energy efficiency. So when you’re bringing Bishop Site Services into the fold, you’re hiring one of the top electrical contractor companies in the business. And that really means that you’re getting the know-how of a licensed electrical contractor who has the experience, knowledge and training to get the job done right the first time. And that comes with Bishop Site Services’ guarantee of top-level service, upgrades and repairs. In many ways, the rising popularity of home automation systems comes along at exactly the right time for Chris, and Bishop Site Services, who offer a wide variety of electrical contracting services for industrial, commercial and residential clients. And that’s because Chris considers home automation as one of his specialties. Chris got involved with home automation right from the get-go. And now, as a certified approved installer for the prestigious Lutron product line, he is able to provide top-drawer lighting and window shades, plus offer cutting-edge wireless systems Caséta and RadioRA 2. Early on, Chris recognized that energy efficiency would be the next evolutionary move in the electrical contracting field and he responded accordingly, seeing that his industrial, commercial and residential clients were kept in the loop. And that’s one of the reasons why Bishop Site Services can confidently offer full-service electrical contracting, industrial automation and energy-efficient upgrades for commercial, industrial and residential spaces. But it’s home automation where perhaps the most noticeable advances are being made. Chris knows that technology now plays a major role in our lives, and smart home systems create safer, more comfortable living spaces with all the conveniences expected these days. Your house can be wired for smart home automation, encompassing nearly every electrical system including lighting, windows and shades, heating and cooling, phones, security, entertainment and home appliances. Computers and other electronic devices can be used to control the various systems in your indoor and outdoor living spaces. At one time, homeowners used timers or motion sensors to control lighting, and relied on traditional thermostats to trigger the heating and cooling equipment. Now, Bishop Site Services can help you program all of those elements into a home automation system. As a master electrician and electrical contractor, Chris is definitely the right professional for the job. He knows that wiring a home automation system into your existing home can become complicated. If the current electrical system is undersized or unable to accommodate for the upgrades, you’ll need to plan for some rewiring. By hiring Bishop Site Services to assess your home, you’ll receive professional calculations and then you can confidently begin installation. Your family will be safer and more comfortable with smart home automation built into the house. With Bishop Site Services assessing a property’s electrical needs, you can then look at the home improvement as an investment, both in terms of value and in quality of life. Convenient, efficient and enjoyable, Chris can show you why home automation is the wave of the future for home renovations. Whether it’s a home automation system or industrial or commercial requirements, contact us at Bishop Site Services to request a FREE estimate. 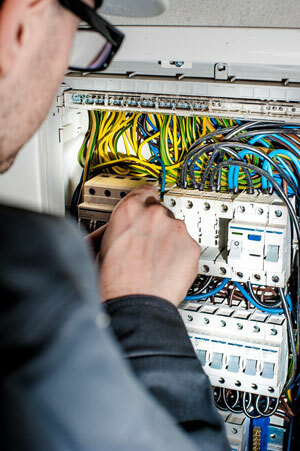 We can’t wait to find the best solution for your electrical system needs. Bishop Site Services covers the Brantford-Brant area, Hamilton, Burlington & Oakville, Kitchener-Waterloo, Cambridge, Woodstock, London, and all the way down to the shores of Lake Erie. From upgrades to complete installations, Bishop Site Services is the electrical contractor for you.